The right swing set hardware and equipment is an essential component of a safe and fun playground that the whole family can enjoy. 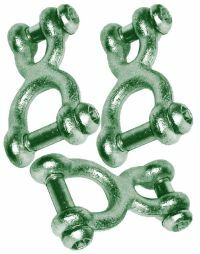 From swing chains and hooks to swing set hardware brackets and braces, Playkids has exactly what you need. If you want to add a swing to your outdoor play area, we offer a wide array of swivels, hangers, and hooks to help you get the job done easily and quickly. All the commercial playground equipment you need, such as pipe swing connectors, brackets, and fasteners, are right here. Broken swing sets are not fun. Order quality playground equipment parts from PlayKids today to get the fun back to your yard! L = 5.25" W= 2.00" H = 4.00" distance between 2 holes # 3 5/8"
*Free Ground Shipping in continental USA Ships within 72 Hrs [Except Holidays] (All orders not within Continental USA must be called in 1-800-PLAYSET or (305) 591-1160 to place order) *=Ground Shipping Included when you purchase the item Residential weight Limit = 150 lbs. 1. Encourage bonding before birth. Invite your son to pat your tummy, talk to his future sibling, feel him kick, and even attend your prenatal visits to listen to his heartbeat. Also, help him feel involved by letting him take part in decorating the nursery, picking out some of the baby's clothes, and choosing a name. 2. Prepare him for life with an infant. Together, look at pictures of when your child was a newborn. Explain that babies need lots of extra care and attention (especially from their parents) and they spend a lot of time eating, sleeping, and crying. 3. Don't let him become second fiddle once his sibling arrives. When an admirer says "What an adorable baby" in front of him, add "And he has an adorable brother too!" Make sure that he still gets lots of special time once the baby is born. Extra father-son time is always a good idea, especially when they're learning "big boy" things like how to ride the zipline at the local park. 4. Give him a fun job title. "Mommy's assistant". Then put him in charge of simple tasks, such as fastening the baby's diaper or handing you a wipe during changes. Feeling important will make your firstborn relish being the big brother. 5. Try role-playing. Teach your older child to be the protector, saying something like "Be sure that the baby's blanket is covering her feet so they don't get cold." This will help define his role as a compassionate and thoughtful brother that will hopefully last into adulthood. Big brothers are the ones who are going to teach them how to catch a ball, shoot a marble and ride the zipline. The earlier this relationship is instilled - the better. It's tough at first because babies are a lot of work and take up all of the attention. But with time, care and consideration, your boys will bond. Before long you will be watching them on playgrounds, zooming by on the zipline and winning trophies at little league. Teaching them to love each other is important. After all, pals may come and go but a brother can be a friend forever. Play Ground Equipment Part 2. Swing Sets by Playkids are the fun way for kids to exercise.